"Angels Rest and Devils Rest, Oregon"
Click image to enlarge Angels Rest (ridge left) and Devils Rest (cone on top), as seen from Tunnel Point, Oregon. Angels Rest is Columbia River basalt and lies uphill from Dalton Point, Oregon. Devils Rest is a Boring Lava cone. Image taken October 10, 2004. Angels Rest, a Columbia River Basalt flow, looms over the Columbia River while Devils Rest, a Boring Lava cone, sits atop Angels Rest. On the west of Angel's Rest is Coopey Creek and Falls and on the east is Dalton Creek and Falls. Further east is Mist Falls and Wahkeena Creek and Falls. 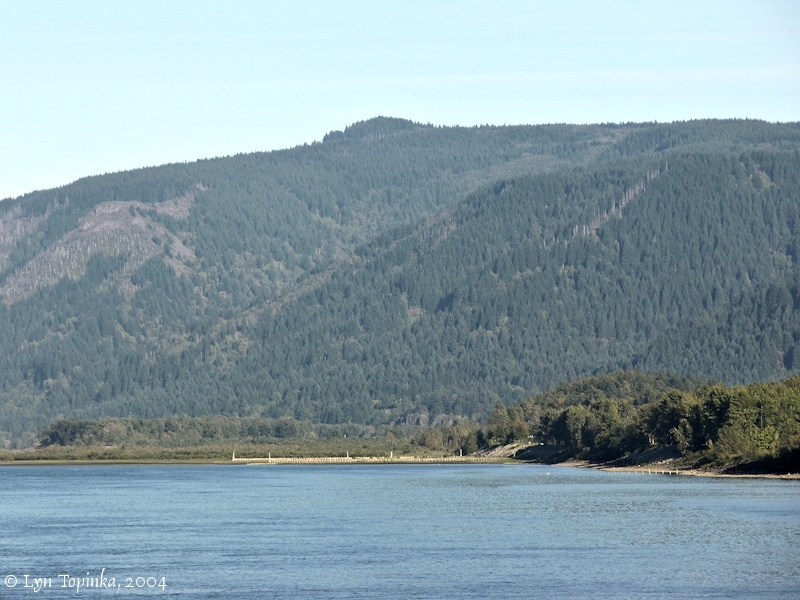 Click image to enlarge Columbia River Gorge looking upstream, as seen from Tunnel Point. Image taken October 10, 2004. Angel's Rest was once known as "Fort Rock". "...Devil's Rest sits on land which was once owned by Charles Coopey, for whom Coopey Creek and Coopey Falls are named. Coopey, an Englishman, named the summit Eagle Eyrie. He eventually gave the land to the City of Portland, which also owned Multnomah Falls in the 1920s. In 1939 the City of Portland transferred all of its Columbia Gorge holdings south of the railway to the U.S. Forest Service. ..."
In the early 1900s Angels Rest was called "Fort Rock". "... Coopey creek comes out at the west side of Fort Rock. Its attractive lower falls, 117 feet in height, is to be seen a few steps from the Highway. The upper falls, which is passed several hundred feet up on the Fort Rock trail, appear to mark the contact of the gravels and the basalt, as if, in its downcutting the harder lava had proved so much of a barrier that the stream was compelled to tumble precipitately over, instead of taking the time to deliberately saw through it a channel of more uniform grade, such as it was able to do in the less resistant gravels above." "... 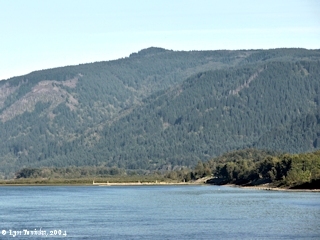 Traveling eastward from Portland, the motorist passes thru Troutdale, across the Sandy river, catches a glimpse of Rooster rock near the Chanticleer inn, and the Crown Point chalet, overlooking Vista house, at Crown Point, where a splendid view may be had up and down the Columbia, flowing 750 feet below. One may see for thirty miles in any direction. The scenic effect is wonderful, and here indeed is keenly felt the magnificence and splendor of this mighty stream. From this point the road spirals downward in a triple figure 8, descending 600 feet and never getting off a 40-acre tract of land. Next in order are Latourell bridge, to the right which are Latourell falls (193 ft.); Shepherd's dell; Coopey falls, which are far up on the cliff, and Bridal Veil falls. You now pass between Lone rock and Fort rock, where legendary giants battled in the days of long ago, and come upon Mist falls and then Wahkenna falls, located in Benson park. Next is Multnomah falls, the queen of American cataracts. ..."
Source: The Automobile Blue Book, 1919, "Points of Interest, Columbia River Highway"
The trailhead for Angel's Rest and Devil's Rest begins on the Historic Columbia River Highway just east of Bridal Veil. The hike to Angel's Rest is a moderate hike, gaining 1,450 feet of elevation, and is 4.8 miles round trip. The trail to Devil's Rest branches from the Angel's Rest trail and rises another 850 feet. Parking is at the junction of the HCRH, East Bridal Veil Road, and the road to Palmer. 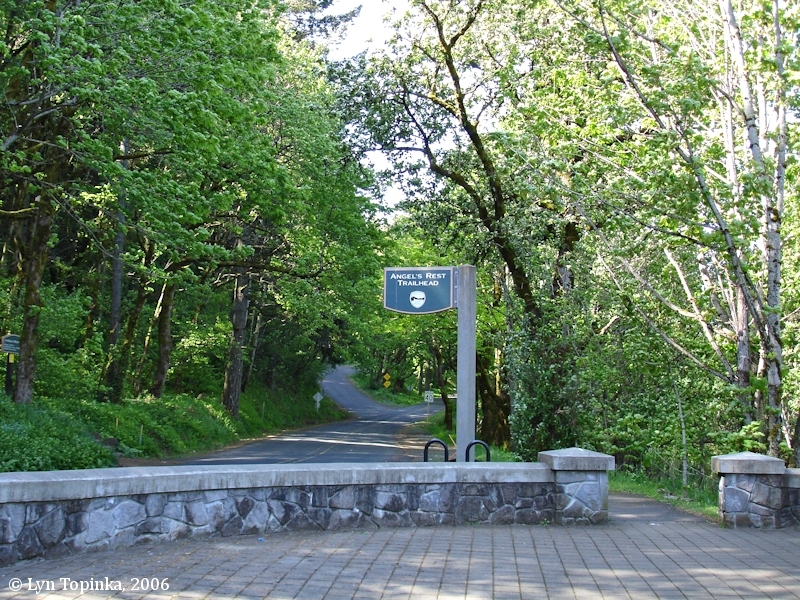 Click image to enlarge Angel's Rest and Devil's Rest Trailhead Parking, Historic Columbia River Highway. View looking west, taken from moving car heading east. 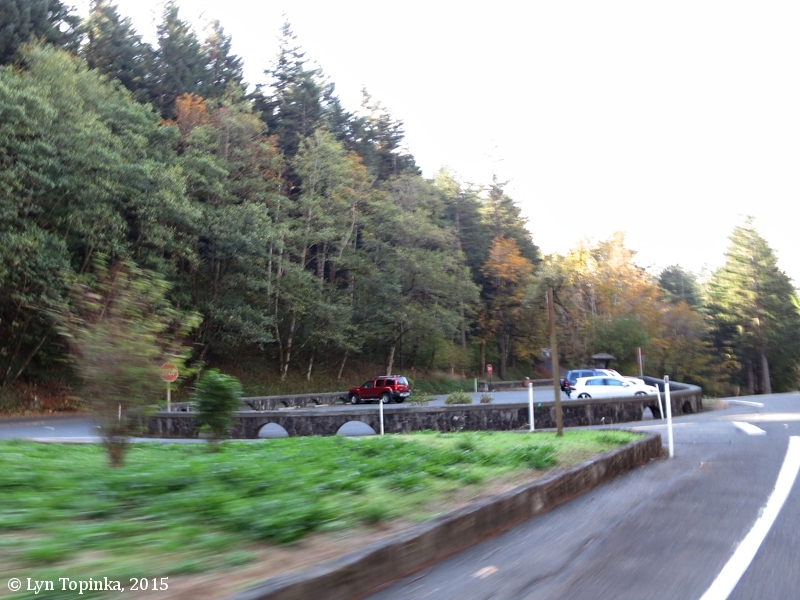 Image taken October 22, 2015. 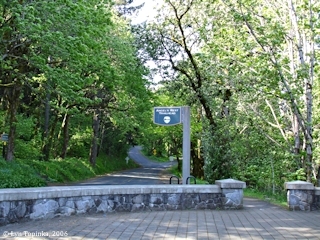 Click image to enlarge Angel's Rest Trailhead sign, Historic Columbia River Highway. Palmer Mill Road is in the background branching off of the Historic Columbia River Highway. The trailhead is to the left. Image taken May 10, 2006. 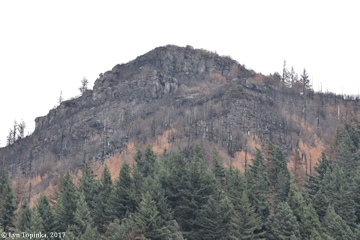 The Eagle Creek Fire started on the afternoon of September 2, 2017, by some immature youths playing with fireworks. The fire quickly engulfed the Columbia Gorge behind Bonneville Dam. By September 5th the fire had moved west towards the Crown Point area. As of October 13, 2017, the fire had grown to 48,831 acres and was 50% contained, with areas from Cascade Locks to Troutdale being impacted. Click image to enlarge Eagle Creek Fire 2017 ... Angels Rest as seen from Interstate 84, Oregon. View from moving car heading east. Image taken September 25, 2017.